Yuehe Lin included on 2016 Highly Cited Researcher List. Kudos to Yuehe Lin, a Laboratory Fellow at Pacific Northwest National Laboratory, for being included on the 2016 Highly Cited Researcher list from Clarivate Analytics (formerly Thomson Reuters). Lin, who has 360 publications to his credit, also appeared on the list in 2014 and 2015. The current list was based on publication and citation statistics from between 2004-2014. It features scientists from around the world whose citations rank in the top one percent within 22 subject areas. Citations accrue when newly published scientific papers refer back to previously published research findings. 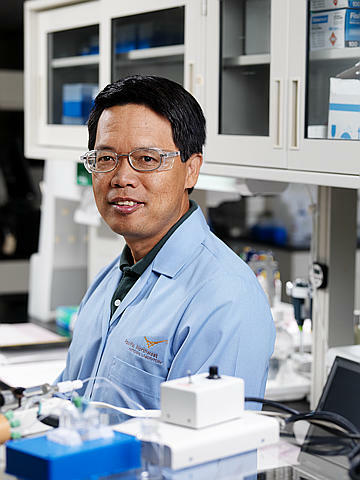 Lin is a Washington State University professor with a joint appointment to PNNL in material sciences. He studies nanotechnology, particularly the development of new nanobioelectronic devices and nanomaterials for biomedical diagnosis and drug delivery. His other research activities include developing integrated microanalytical systems for environmental and biomedical analysis, and synthesizing functional nanomaterials for energy and environmental applications. A total of six PNNL researchers were named on this year's list. The others are Richard Easter, Steven Ghan, Janet Jansson, Jun Liu, and Philip Rasch. See the PNNL news release for more information.